The aim of this essay is to understand the relationship between knowledge and society and to reflect on the links between science and political decision making. The text evolved from a number of reflections the author made while president of the European Astronomical Society, president of the Swiss Academy of Sciences and vice-president of the European Academies Science Advisory Council (EASAC). 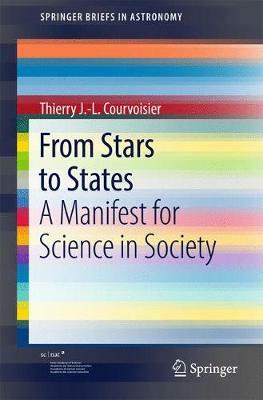 The book starts by using astronomy as a showcase for what science brings to society in terms of intellectual enrichment, of practical tools and of societal inputs. It then turns to looking generally at science as a human endeavour for which pleasure is a prime motivation and it describes the efforts made by researchers to rationalise their findings, thus making them universally acceptable. The author also describes the role of science in shaping our environment and discusses resulting responsibility of the scientists with respect to the evolution of the world. As part of an analysis of the relationship between science and policy the author describes the way in which scientists can (and must) bring knowledge in the political decision making process. The argument is closed with considerations on global governance, while the conclusion puts evidence based decision making processes in relation with the more emotional aspects of our behaviour. The readership of the book is intended to be all scientists involved in "science for policy" activities, as well as those who should become more active in this domain. This includes, but is not limited to, all members of science academies. Astronomers will find specific elements to help them think about their science. The intended readers of the book also include civil servants and policy makers who develop legislation and societal action in domains in which a solid knowledge base is important. The book should furthermore be of interest to citizens following public life and all those worried by the "post evidence" trends in policy.